i often reference being behind on life here on the blog. well, the reality is that i am eternally behind on life. to illustrate this point, here are some photos from Halloween. hot off the presses. . . 18 days ago. first, it is important to note that Halloween can be stressful. especially when you are three and faced with the blank canvas that is a pumpkin. fortunately, dad was there to save the day. anth was also there to carve this ghost. though, i don't have decent picture to prove it that involves either of his eyes being open at the same time. also, my colleague Mary Anne was there that day. but she and i spent lots of QT on the phone together for work, so it kind of felt like it. glad to have you with us, MAK. at long last, it was time to don the halloween garb in the pursuit of sugar. benny spent some time practicing his light saber skills while anthony finished getting ready. then it was anth's turn. he was rather intense about the whole thing. the boys' friend Alex came over to trick or treat with them. she had a costume with a light up skirt. this was significant to anthony, because he found it rather important that they all had the opportunity to "glow a little" between her skirt and the boys' light sabers. so close to the perfect picture. of course, ben is actually smiling. i just can't prove it's him. 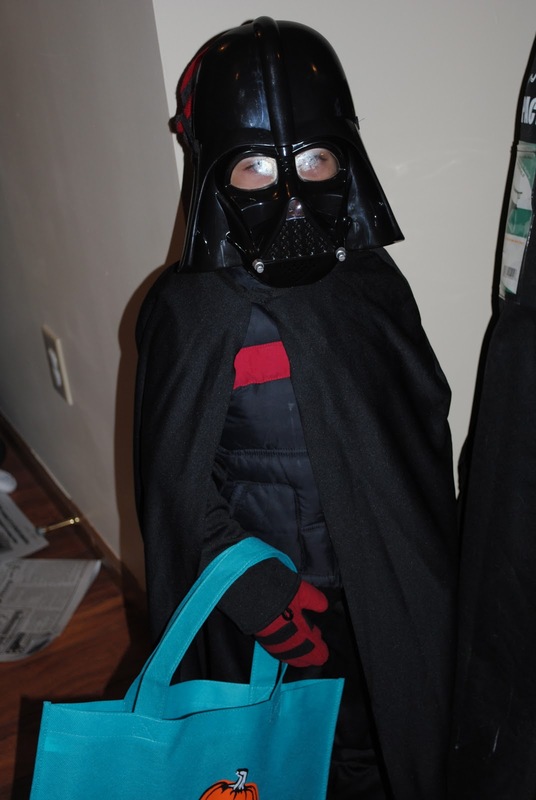 the effect of darth vader bundled in vest, hat and gloves. with a bright teal trick-or-treat bag. the really good halloween photos.